Jaguar has announced pricing for the new XF that will go on sale in June in Australia. Starting from $105,500 (RRP), the new XF is a dramatic expression of the bold new Jaguar design language, with a driving experience that even exceeds the expectations provided by the striking appearance: relaxed and confident with outstanding ability and control. The XF's choice of 4 outstanding engines means the perfect powertrain for every driver preference. It offers everything from one of the most refined diesels in it's class, the 2.7 turbodiesel, through a choice of 3.0 litre V6 or 4.2 litre V8 petrol, to a 4.2 litre supercharged V8 petrol with 306 kW. All XF's feature a six speed automatic transmission that includes a unique, all new JaguarDrive selector - an industry first rotary shift interface - and the Jaguar Sequential Shift System with steering mounted paddles for one-touch manual control. Whatever the choice, they all offer refinement, flexibility and outstanding performance. Jaguar dealers have taken close to 200 pre-sales orders in Australia, which is considerably above expectations this far ahead of launch. "The interest in XF - before anybody in this country has even driven the car - has been very satisfying. If things continue in this way, we may have sold out our entire 2008 allocation before a single vehicle is on the road here. What is also encouraging is that the XF is attracting a new group of customers to the Jaguar brand: more than three-quarters of those who are contacting us about XF have never owned a Jaguar before." commented Dorian Lapthorne, General Manager, Jaguar Australia. The new XF is a milestone for Jaguar. In every respect it signals the future of the marque - and yet it remains true to the essence of what has always made Jaguars great cars. 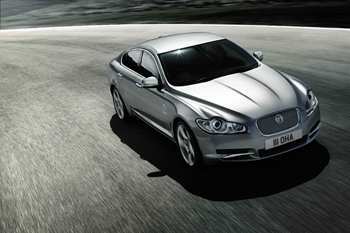 The financially plagued Jaguar brand is expected to be sold to the Indian company, Tata, is the near future. Ford, owners of Jaguar, have bundled Jaguar with Land Rover to sell the troubled British brand.